Cricket was a passion in Victorian society that has been described as ‘a ritual as well as recreation, a spiritual as well as a sporting experience’. William Howie Wylie, in his book Old and New Nottingham (1853) claimed that before the 1845 Enclosure Act there were four official cricket grounds in Nottingham: on the Forest, in the Meadows, on the Clayfied and at Trent Bridge. Trent Bridge was not affected by the Enclosure Act, but the other spaces were. As the town expanded, the surrounding field systems were filled up with new houses and the pitches fenced in and patrolled. The importance of the sport to the town, however, ensured that these traditional venues not only remained available for cricketers, but were managed and developed. 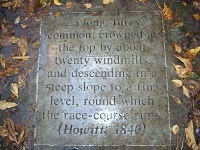 According to the Nottingham Journal, the ground on the Forest, improved in 1843, was bounded by strong posts and rails and surrounded by an elevated spectators’ platform eight feet wide, clearly a reflection of the reverence given to the sport. By 1859, the condition of the ground had deteriorated due to overuse. It was closed for a year to allow new turf to be laid and new pitches were created by lowering and levelling 2 acres of land near the Cavalry training ground and a sewer was laid to take away surface water. The Council agreed to these improvements provided the cost was less than £150. As a result of a campaign by the clubs who used the cricket ground on the Forest, in 1880 a new pavilion was built at a cost of £518 and an attendant was appointed to manage the pitches. In 1881 it was calculated that there were over 14 acres of land for pitches, plus another 7 acres of ‘rough’ space for casual matches, but this was only about two-thirds of the space demanded by clubs. On 15 June 1881The Nottingham Evening Post listed eight matches played on the Forest on the previous Saturday. Teams included New Basford Baptists, Messrs. Ward and Cope (2nd Eleven), North Nottingham Institute, Forest Wanderers and St Ann’s. This number of games on one day was not usually as newspaper reports over the next 25 years proved. The cricket ground on in the Meadows (now called Queen’s Walk recreation ground) has a similar story. In 1856 the ground was found to be unfit for use and a recommendation was made that it should be closed for levelling and returfing which cost £75. 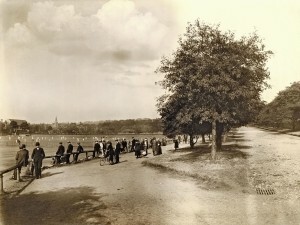 By 1864, the condition had again deteriorated and it was suggested that additional land on the other side of Queen’s Walk should be leased to allow more pitches to be created. On the same Saturday in 1881 that 8 matches were played on the Forest, a further six were played in The Meadows, including St Peter’s Amateurs v. George Street Baptists and Castle Imperial v. St. Saviour’s. The amount of cricket (and football) played in The Meadows meant that in 1884 Sergeant Watson, a retired policeman, was appointed at caretaker for 15s per week during cricket season and 10s during football season. In 1910-11, it was proposed to close all the cricket pitches on Queen’s Walk recreation ground – as it was sometimes now called – so that it could be used solely by children, much to the dismay of the many cricket clubs that were being evicted from their traditional grounds. The idea was abandoned. 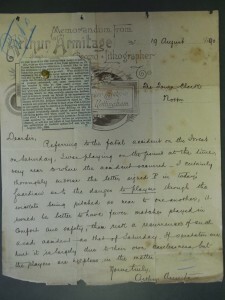 Letter to Town Clerk informing him of circumstances of accident. The fate of Bath Street cricket ground on what used to be the Clayfield was a bit different. Although it was popular, Bath Street appears never to have attracted the same level of cricketer as the other two grounds. Its location may have been part of the problem. In 1882 the Public Parks Committee received complaints about the number of cricket balls being hit into the adjoining streets. In July 1884, it was decided to restrict cricket in Bath Street to under 13s because of the ‘rough and dangerous character’ of some of the play. Such concerns were serious. 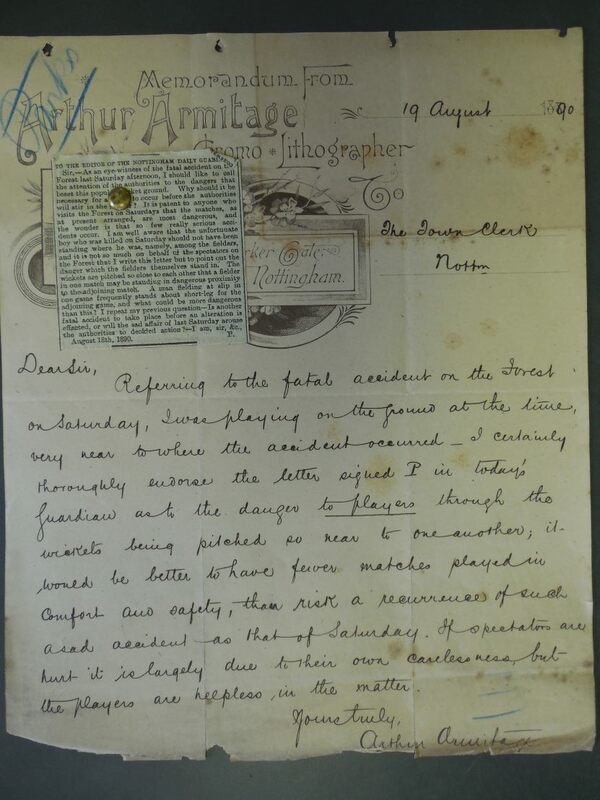 The newspapers of the time contain many reports of deaths and injuries around the country resulting from being hit by cricket balls, including the death of an 11 year old boy in 1890 on the Forest ground. The cause, according to one witness, was that the wickets were too close together.In 1893-4 Bath Street, which by this time was seen as an eyesore with barely a blade of grass on the pitches, was transformed into Victoria Park. According to a report in the Nottingham Evening Post, the new park had been laid out with walks, lawns, shrubberies as well as swings for children. By this date, there were also grounds on Victoria Embankment, Vernon Park, Bulwell Forest, and Bulwell Hall Park, as well as many other free practice areas. The following year, however, it was noted that at both The Forest and The Meadows, the cricket grounds were regularly used but the football grounds were not in such great demand ‘owing to several Clubs being disbanded on account of many of their members joining the Colours’. Nottingham’s love affair with cricket continues.